While most people will be at home relaxing this festive season, a number of graduates from the Youth Empowerment Organisation (YEO) will be doing their bit to help the less fortunate. 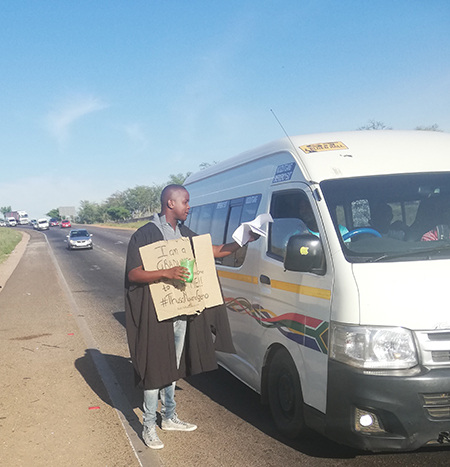 From 1 December until the end of January 2019, graduates in their graduation gowns will stand at various intersections in Potchefstroom, Pretoria and Polokwane asking motorists for donations. This is part of the organisation’s Thusangwanageno (help your brethren) initiative. The donations collected will go towards registration and tuition fees of prospective students who have been accepted at any South African university. The YEO is the brain child of John Molepo, a lecturer in the School of Government Studies at the North-West University (NWU). The aim of the Thusangwanageno initiative is to help more than 200 students in 2019. Students will also be assisted with the necessary stationary to start with their academic journey. Regular workshops will be held to ensure that they are supported and continuously encouraged to stay motivated and to ultimately ensure success. This year Thusangwanageno assisted 108 students with registration fees and others with outstanding university fees. John is calling for volunteers to be part of this initiative and also for donations. Students are requested to visit www.youthempowermentsa.co.za to apply for assistance. John can be reached at John.Molepo@nwu.ac.za or 0767502300. The NWU's John Molepo asks motorists for donations for the Thusangwanageno initiative.